Malta has become the second country in the European Union to lower the national voting age to 16. The revised voting age, down from 18, was cemented into law on Monday evening, with MPs voting unanimously in favour of a third reading of a Bill to amend the Constitution to that effect. 16- and 17-year-olds will now be able to cast a vote at national and European parliament elections, having been already granted that right for local council elections back in 2014. Their first opportunity to exercise this new right will come during the 2019 European Parliament elections, with the lowered voting age expected to add up to 8,500 votes to ballot boxes. Politicians from either side of the House were quick to celebrate the news on social media, with Prime Minister Joseph Muscat saying Malta had "made history, again" by passing the law. In a statement, parliamentary secretary for citizenship Julia Farrugia Portelli noted that Malta was among the first 10 countries in the world to extend voting rights to 16-year-olds. Malta's move follows the precedent set by Austria, which introduced a 16-year-old voting law back in 2007. Brazil, Cuba and Nicaragua are among other, non-European countries to grant the ballot to voters that young. The Party of European Socialists commended the Maltese government, lauding Joseph Muscat for "continuing to enact a strong and progressive agenda". "Lowering the voting age to 16 completes the important democratic reform initiated by Partit Laburista when they removed the bar on 16-17-year-olds voting in local elections, fulfilling a pledge made during the election campaign," it said in a statement. In another statement issued minutes after the reduced voting age was passed into law, the National Youth Council said that this "step in the right direction" had to be followed by both formal and informal education to increase civic education. The council also drew the government's attention to a couple of legal anomalies brought about by the change. One concerned the age of sexual consent, which remains fixed at 18. The other concerns participation in voluntary organisations: existing laws, the KNZ said, prohibit voluntary organisations from registration if they allow the involvement of youths under the age of 18. 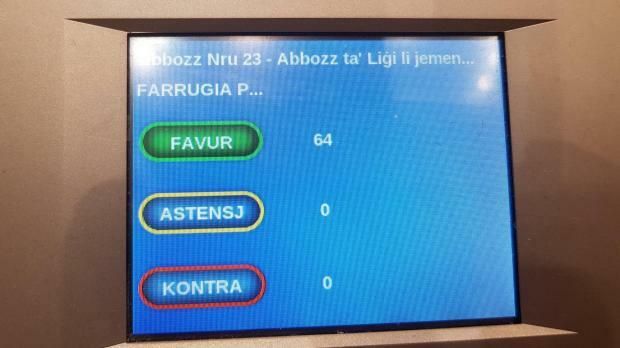 Votes were also held on an Opposition motion to return control of the Żonqor land transferred to Sadeen to build a university campus on and on the second reading of the Budget Estimates Implementation Bill. The Opposition's Żonqor Point motion was defeated while the budget estimates bill was passed. Earlier on during the session, the Standing Committee for Public Appointments was constituted, and will be chaired by Government MP Edward Zammit Lewis.